The word “pellizco” in Spanish refers to a “pinch of something” as well as a physical “pinch.” However, a “pellizco flamenco” holds much greater significance. “Pellizco flamenco” is a magical quality that cannot be expressed in words; it can only be felt. It is a “pinch” of something small that results in great artistry; it enters through your skin and makes your heart vibrate. Pellizcos de Entretiempo was born from the great success that followed the production Entretiempo, an innovative merging of fashion and flamenco through the collaboration of dancer Sonia Olla and designer Modesto Lomba. 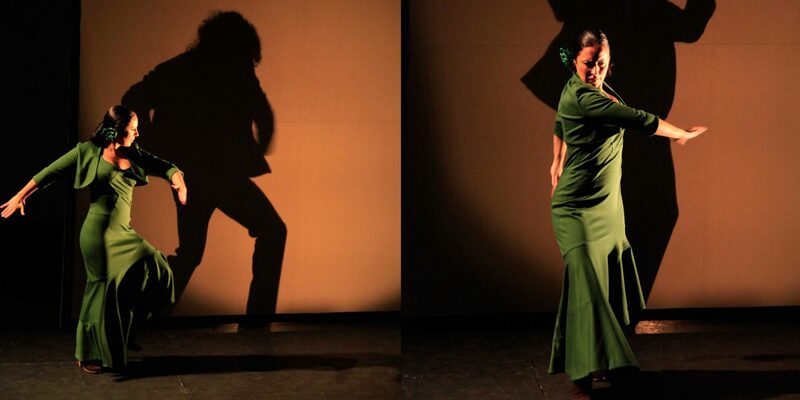 Pellizcos de Entretiempo features excerpts of the original production as adapted for more intimate venues featuring protagonists Sonia Olla and renown dancer David Paniagua. With this production, Sonia Olla continues her efforts to bring the joy of flamenco, recently declared an “intangible cultural heritage” by UNESCO, to all aficionados and the public at large. Modelos de videoescena: Cristina Maeso, Naomi Castillo, Silvia Gutiérrez y Alexandra Johnson. Percusión: José Antonio Haro Álvarez "Montaña"